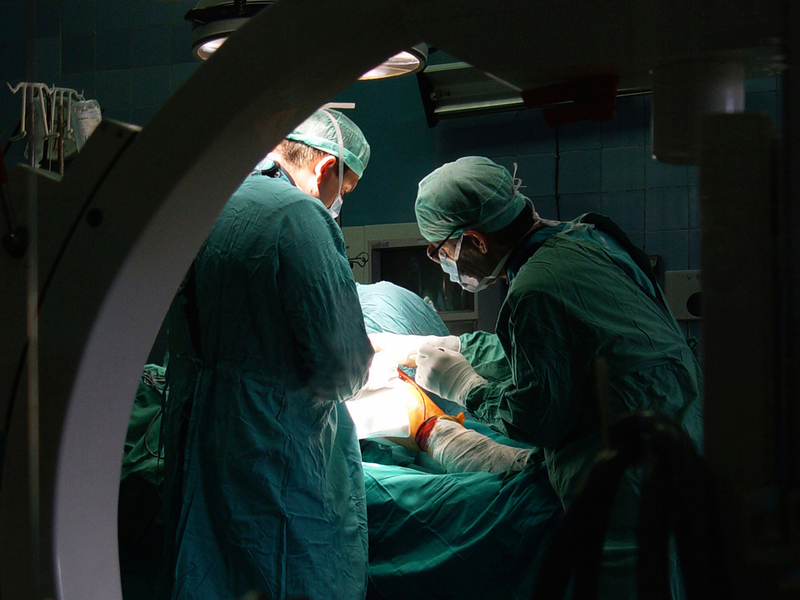 When Should Surgeons Stop Operating? : Shots - Health News A quarter of U.S. physicians are older than 65, and there are no national guidelines for assessing late-career skills. Some say the lack of oversight, especially for surgeons, is cause for concern. A program based at Sinai Hospital in Baltimore offers a two-day series of assessments for older surgeons, evaluating "physical and cognitive" function. Increased fatigue, forgetfulness, and reduced eyesight — these are some of the declines that can come with aging. Certain professions keep a close watch for these sorts of changes, in hopes of protecting the public. And some jobs even have a firm age cutoff: Airline pilots are required to retire at 65, for example, and some firefighters must step down by 57. But there are no nationwide age-related cutoffs, required assessments or guidelines to make sure doctors can do their jobs safely. We all know 80-year-olds who can play an intense game of tennis and others who can't even walk to the mailbox. Surgeons are the same; many still do great work in their 70s, but others should not be practicing anymore. Dr. Mark Katlic, author, "The Aging Surgeon"
One of every four licensed U.S. doctors is older than 65, with two-fifths of them actively practicing, the AMA estimates. The goal of creating guidelines, the organization says, is to head off calls for a mandatory retirement age while still safeguarding patients. Dr. Mark Katlic, a 63-year-old thoracic surgeon at Sinai Hospital in Baltimore, was not involved in the AMA report but is a strong proponent of guidelines tied to competency, particularly for surgeons. "We all know 80-year-olds who can play an intense game of tennis and others who can't even walk to the mailbox," says Katlic. "Surgeons are the same; many still do great work in their 70s, but others should not be practicing anymore." Katlic points to several worrying anecdotes he has heard of excellent surgeons who ran into trouble as they got older. One needed to be led back to his office after an operation. Another began showing up to work sloppy and unclean. Still another surgeon fell asleep while performing a procedure. "I think the general public would be very interested to know that [surgeons] don't police [themselves] well as a profession," Katlic says. "It often takes a bad complication that hurts a patient before something serious is done." Surgery requires solid mental and physical capabilities that some older surgeons may be lacking, he says. Fine motor skills are needed to wield sharp scalpels; endurance is essential for long procedures, and quick reaction times are a must, too. If a problem arises in the operating room, surgeons need to analyze the situation swiftly and make decisions on the fly. Dr. Roger Perry, a surgical oncologist at Eastern Virginia Medical School, says this key problem-solving ability, known as fluid intelligence, can decline with age. No operation is ever the same as any other, Perry says. "You need to be able to figure things as you go, and when problems arise, recognize an alternative." But how do you determine whether a surgeon can no longer be trusted with the scalpel? Since people age differently, a mandatory retirement age for surgeons is unfair, Katlic and Perry say. The key is creating a series of tests and guidelines that check capabilities, instead of using chronological age. The Aging Surgeon Program at Sinai Hospital is one example of this. Created by Katlic in 2014, the program invites surgeons from around the world to come Baltimore to take a two-day test that rates their physical and cognitive abilities. Among the many skills and attributes examined, the test evaluates hearing, vision and hand-eye coordination. Surgeons who are concerned about their health can opt to take the test, but hospitals can also request evaluations of their surgeons. The results and recommendations — good or bad — are entirely confidential and supplied solely to the individual who requested the evaluation. While it may sound like a good option for senior surgeons, the program has had its difficulties. For one, not a single doctor has stepped forward to take the test. "However, we've learned that a number of physicians have opted to retire when threatened to be put through our program," Katlic says. Stanford Health took a similar approach in 2012 when it created the Late Career Practitioner Policy, requiring physicians over the age of 75 to be screened every two years. The policy has faced opposition among Stanford faculty members, though, with some arguing that there is no research proving older physicians are more likely to make mistakes than younger doctors. Some critics of these sorts of tests and guidelines say they are needlessly discriminatory and should focus on competency, not age. Others point out that physicians, of all people, have the training and experience to evaluate their own health and shouldn't need outside oversight. But that's not good enough, Katlic and Perry say. Doctors are human, too. "Most people, regardless of the field they fall into, fail to recognize that they are not doing as well as they used to," Perry said. "We all know people in our families who are driving that shouldn't be — but if you speak to them, they think they are perfectly fine." Perry thinks that, with time, the need for competency tests will become accepted by doctors. And with that acceptance, he says, participation in the Aging Surgeon Program will increase, too.